If you have been keeping up with the latest trends in wedding decoration, then you obviously must have come across umbrella in Wedding Decoration. 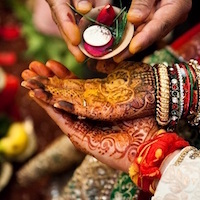 Do not restrict yourself to thinking of umbrella as decoration in just monsoon weddings. In fact, umbrella in Wedding Decoration can be used irrespective of the weather! There are so many ways to make use of an umbrella in Wedding Decoration. If you are feeling creatively challenged then read on to know more! Embroidered Umbrellas give a very royal and majestic feel. You can prop them up on large stands to decorate the entrance. 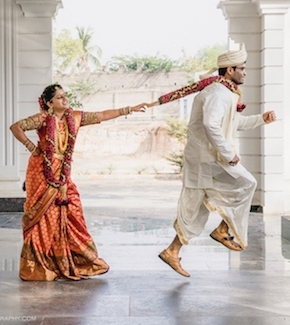 When the baraat arrives, they are sure to be mesmerised by the grand welcome! In fact, if you are from the groom’s side, you can make use of an embroidered umbrella for the groom as well. Remember the royalties of Rajasthan with their embroidered and sequined umbrellas? You can replicate the same with just one umbrella! Everyone’s doing it! If the wedding is to take place in daylight, you can offer a shady walkway by using umbrella in Wedding Decoration. Choose colourful umbrellas and it will add a splash of colour to the wedding. Plus, they make attractive backgrounds for the perfect wedding shots! Therefore, you would not even have to worry about the harsh sunlight or the decorations. 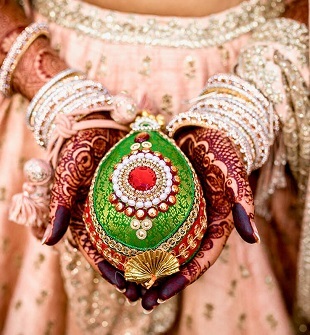 Of course, if the wedding is at night, then all the colours will look the same. So, here’s how you can spice it up. Pair up the umbrellas with lights and fairy lights to give the wedding a fairytale twist. The dispersed lighting will make it look even more magical against the inky sky. Hence, you can literally have an air of romance hanging around! Flower vases can easily be replaced with umbrellas. It is even more convenient because a vase can be heavy. 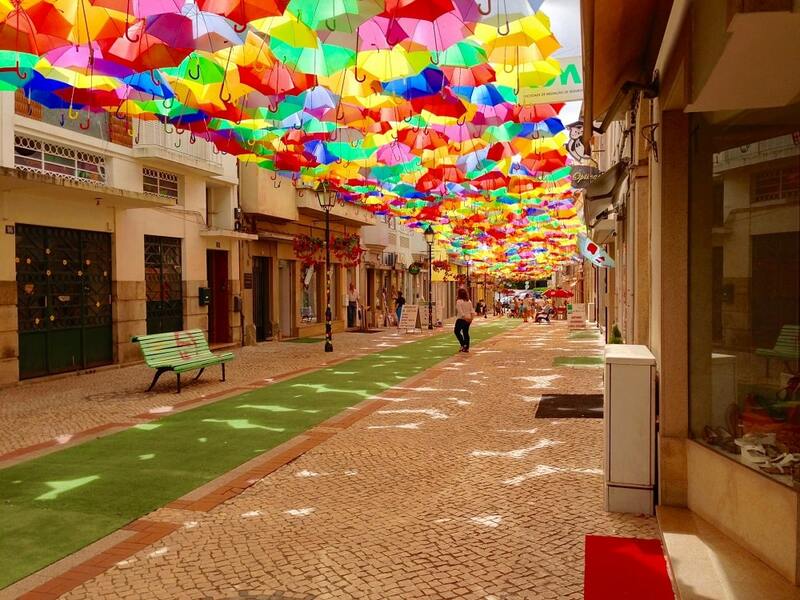 On the other hand, umbrellas are light and can be hung anyhow. 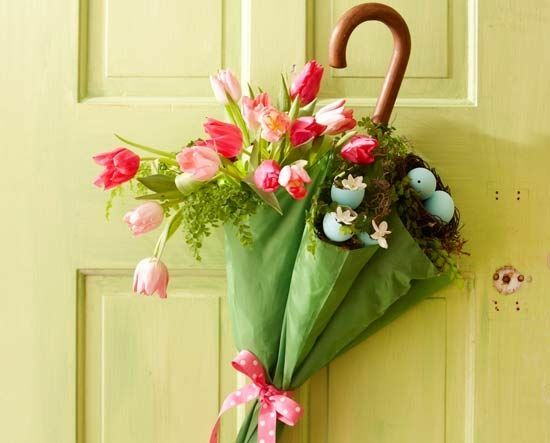 You can make use of real or fake flowers and tie pretty ribbons around the umbrella. These umbrellas can be strung all around the wedding venue. Therefore, being more versatile than orthodox flower vases. You can make use of lace umbrellas to add a touch of elegance to the centrepieces present at the table. The pretty flowers will also not dry up due to direct sunlight and it will also look extremely cute. If you are having a wedding on a lawn, the lace umbrellas will look even prettier against the lush green of the grass. 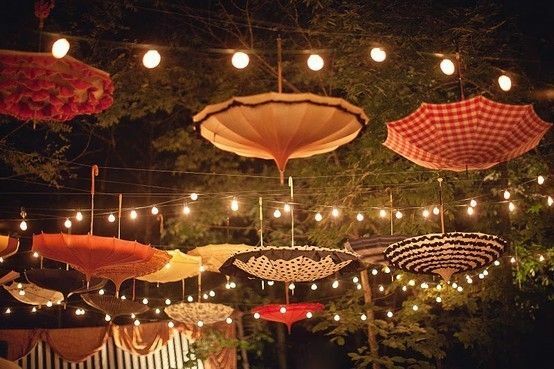 Hanging decorations on the Umbrella is a unique way to make use of Umbrella in Wedding Decoration. The trimmings of the umbrella can be decorated with vines, fake flowers, or even crystals. You can even recreate a forest-like look of the wilderness if you use fake creepers. If you really wish to use an umbrella dedicatedly for the purpose of recreating a look of a chandelier, then the best way to do that is to strip the fabric from the umbrella. You can then hang crystals and chains from the spine of the umbrella. This decoration will look like chandeliers without actually having to spend on a chandelier. You can play around with lights and lighting on this makeshift chandelier and hardly anybody would notice! Thus, you can see that a simple umbrella can be used in so many different ways as a wedding decoration. What are you waiting for? Go ahead and pick out the decoration that suits you best and leaves the guests stunned!